I can’t really run, but due to chance, I’d had a ton of friends who are, marathoners. On that day, I’d gone to train with a group of visually impaired runners to the riverside. They’d used a rope, with knots tied on both ends, one end on the visually impaired runner, the other on the seeing volunteers, like the three-legged race, they’d moved forward together. I’d, followed them closely behind, not long thereafter, there’s, this huge distance between me and them, and, before I knew it, they’d, vanished, into the distances. I’d continued holding my own tempo, with the cold wind blowing across my forehead, sweating down, it’d felt, really, awkward. There’s, almost no one else by the riverside pass, most of the times, it was, just me, and every now and then, a cyclist would, speed by me, and then, I was left, all alone. Most of the time, what accompanied me was, this strong sense of, solitude. “how can you be bored, by ‘thinking’ about it?” in a gathering, the topic of marathon, it’d, sparked up this debate for the two individuals on each end, they’d told me, a ton of imaginations they had of, marathons. One of the accompanying runners started as an “intern”. 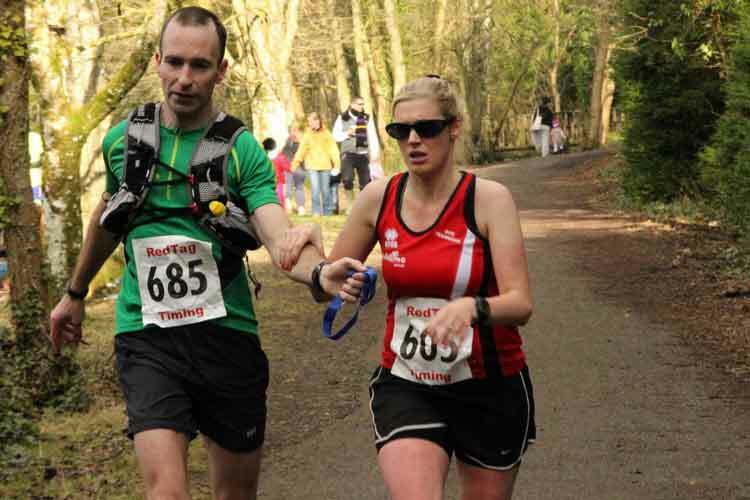 He’d followed a more experienced guide runner to run with the visually impaired. On the way there, he was, led by the experienced guide, and on the way back, he’d, led. He’d spoken, with that disbelief in his voice, “The experienced guide told me twenty kilometers’ worth of stories, and the whole path was only, twenty-one kilometers long, oh mine!” Whatever she’d thought up of, she’d, told me, to her grandmother, to her childhood, to the flowers by the road, the weather, her job………and a turn, before us, there was, this pass, paved with the shades of the trees, and, she’d started, talking about, Mother Nature, what’s meant by “blue skies”, what’s a “green pasture”, what’s a “never-ending ocean”……she was able to, pull out that horizontal pass, and, through it, led the visually impaired runners onto a journey, like the runners aren’t there to run, but instead, to listen to a tale. I was curious, why did she talk, incessantly? Turns out, as the visually impaired runner started running, he’d started cramping, and the volunteer chose to tell the tales, to distract him from his own physical discomfort. If he’d only told of what they’d encountered on the way, it would be, too boring, after all, ordinary people don’t run too fast, and the scenes, are almost, at a standstill; and this experienced accompanying runner, thought of how to get the visually impaired runner, to enjoy the run as he ran blind………so, this, is how fun running a marathon can be! And yet, not all the visually impaired runners are, blessed enough, to have a companion runner who’s so full of facts to tell. I’d recalled that many years ago, I’d, gone to chat with a visually impaired runner of an international marathon on this subject, he was very rational, so was his companion runner, he’d, described the marathons he ran as a “battery cell”. Ahhhhhhhhhhhhh! How much, this, represented life itself! And so, from this, you can see, that running, is no longer just about exercising the body, you need to make the precise calculations, of how much energy it takes you, and, calculate, and factor in all the possible things that can happen on the roads, which is why running a marathon, is sort of an art, and a science! “I’d Never Bent in Business in My Life, Never Borrowed Any Money from Anybody, But, for the Sake of Helping to Raise Funds for the Charity, I Don’t Know How Many Times, I’d, Already Bent My Back, Begged Others, to Pull the Money Out of Their Own Pockets”. The Man Who’d Said this, was the Fu-Wei Technology Group’s C.E.O., Hsiao, He’d Started His Company in Changwha, and it’d Already Grown, to Across the Straits to China, Became a Factory for the Intelligent Switching System’s Provider Company, This Past Few Years, He Had Another “Job” He’d Poured His Heart & Soul into—to Help the Fund for Families & Children to Raise Funds for a Children’s Center, Along with Helping to Sponsor the Children in Poverty Here, as Well as Abroad. In mid-October, the temperature in middle Asia’s Kyrgyz is already in the teens, Hsiao and thirty more other members of the Taiwan Fund for Children & Families arrived in the dead of winter. This group consisted of members for Changwha, they were all small-scale business owners, they’d weathered through the poverty in their childhoods, and built up their businesses, from the ground up. Although many members are approaching their golden years of life, they’d still, taken the three transfers of economy flights to Kyrgyz. Every member of this group had one thing in common: they are all, very stingy when it comes to themselves, but, they’d, become more than generous in their charitable acts, other than being the permanent sponsors who’d donated $200,000N.T. at once, this time, they’d also, taken along the collected funding of $2.5 million N.T.s, other than visiting with the children they were sponsoring, they’d also, hoped to help build the watering stations in the communities too, Hsiao laughed and told, “We pay the highest amount for this trip!”, and this sort of a foolishness, the outside world often, couldn’t, understand. The Taiwan Fund for Children & Family is one of the oldest foundations that helped children out of poverty, in two years, it would enter into its seventieth year of being set up, being able to come so far to this very day, the foundation didn’t rely on government assistance, but the kindness of the members of this society. From fourteen years ago, the foundation started helping overseas, to help the children in poverty in China in helping them attain better education, and improving their health statuses, currently, there are, SIX total stations abroad. There was also, a group of sponsors, who’d flown to the various stations abroad by the year, to visit with their children whom they’d never met, and donated the money to better the living environments locally, although they’re unlike the huge corporations, being able to toss down a huge sum all at once, but, they’d donated their money AND time for long-term. And so, this man started something wonderful, because he’d been tried by his own life, grown up in poverty-stricken environment, and knew, how important, having the necessities of life, including the chance of receiving an education is, that is what he’s helping those children in less fortunate backgrounds to achieve, providing them with their most basic needs, so, the children won’t have to worry, and they can, focus on getting an education, and hopefully, pull themselves, out of the poverty they were, born into. The rain came pouring down on my exercise walk, I’d rushed into the breakfast shops to hide out, the shop owner’s mother in her seventies ushered me in, and she’d, taken out a yellow raincoat from the closets, for me to put on, her act of kindness had, warmed up my heart. As the rain slowly dissipat4ed, as I was, about to, return the raincoat, she’d started telling me the funny things that happened to her while she was on a trip to the eastern side of the island. A couple of years ago, she’d gone to Hualien to travel during the New Year’s holidays with her family, and, the trip was a spur of the moment thing, and, she’d only worn the short sleeves and shorts, and, the cold fronts made everybody shiver, and so, they can only, run back into the cars to hide, they’d not gone anywhere. And, a woman who was standing at the side of the road saw, she’d immediately gone home, brought a ton of clothes for them to choose from, waited until the seven, eight adults and children had, selected the thick coats and smiled and said their thank yous, they’d wanted to ask her address, so they can send the clothe back, but, the woman turned them down. She’d told them, that her kids are all grown and lived elsewhere, that the clothes were just, taking up space in her home. And, every time after that, as the family saw the clothes, they’d always, smiled on it, and, remembered the kindness from the woman, who’d given them the coats to wear. In order to keep the love flowing, the breakfast shop also gathered some donated clothes for the comers to borrow, other than keeping the shop connected with the local communities, it’s, a way of repaying the woman for her kindness. As I’d heard, I thought, maybe I can write this tale down, or maybe, by chance, that kindhearted woman that the family met in Hualien will see, that her kindness had become, a cycle already. And so, this, is how some random act of kindness had touched so many lives, and, by passing the kindness to the strangers that came to the breakfast shop, the owner is keeping the kindness that was shown to her and her family flowing, and we need more stories like this in the world we live in right now! Yesterday was the “No More Fears for Homosexuals Day”, the Taiwan Partnerships League had asked seven homosexual couples to share their stories with the public, and, “coming out of the closets” became the focus of the discussion. There were over hundreds of the public who’d attended the forum, there were mothers with their children, and four members of the Taipei’s First All-Girls’ High School who came, in their school uniform, to conduct an interview. The very first gay couple who had an ad on their union, He, Wang, celebrated their third anniversary on May 19th, even bought the prepared cakes to share their joys with everybody else there. Lai’s father suggested that as the homosexual children come out, they’d wanted their parents to feel at ease, in the areas of health, academia, and life in general; but, coming out of the closets is only the first step, they’d still need to know and understand one another. He’d spoken truthfully, from before he didn’t interact with his son that much, when his son came out, he’d thought to himself, “Would I keep watching his backside, or, will I NOT even see the shadows he’d casted?”, after he’d accepted his son as he was, they’d become closer to one another. A physically handicapped homosexual, Vincent told, that he and his partner had introduced each other to one another’s families a very long time ago, it’s just that they didn’t tell the families that they are lovers, and the family was so grateful at how Wei-Wei is so kind to Vincent. Until once, his mother told others, “if something were to happen to Vincent in the future, ALL of his assets go to Wei-Wei, you all can’t fight him over it!”, that, was when Vincent learned, that his family had already accepted them, as a couple. From this, you can see, that the support from the families is all too important, because families are the people whom you’re closest to, and, to disclose a part of who you are, is the hardest part, but, these homosexual couples had amazing members of their families who’d given them all the support they needed. Last year, the volunteer for the raw materials at the March 18th student movement, Wu, saw how the donated food got dumped out because it couldn’t be finished. There were homeless people who’d come forth and asked, “if he could have some of the foods?”, and someone had turned the man away, using, “the food is for the students”, it’d made Wu empathic. One evening, the resources group received a casing of steamy buns, Wu’s coworkers from Fair Trade Organization, Chu, Chang were able to sneak the buns to Longshan Temple. That, was their very first encounter with homeless people, and, their views of the homeless were altered completely. Wu said, that day at Longshan Temple, he’d met an older man, who’d handed out the steamed buns for them, at eight or nine in the evenings, as the homeless had returned home to sleep after working their odds and ends, the older man kindly placed the buns next to those who were already asleep, and it didn’t play out like how they thought it would, people fighting over the food items handed out. After being in long-term contact with the homeless, they’d understood, that the homeless don’t just lay around all day, and do nothing, seventy percent of the homeless actually have jobs, and they’d gone out, early in the morn, to work, and, it may be working at the construction sites, or, holding up signs by the side of the roads. Chu wanted to do something for these individuals, so, she’d called up Wu, Chang, plus her coworkers, “Uncle”, “Baby”, and became the team of “the Tastes of Life”. The five youths averaging not yet 30, last July, put forth the “Stone Soup Project”, asked the online community to donate the foods that they can’t manage to finish, and the team found a chef, to cook the hot meals, so the homeless won’t go hungry. “The Stone Soup Project” had gotten a ton of supports, and, there were local shops in Wanhua that had supplied the food sources, and they’d held over eight Stone Soup Food Sharing Activities. Not only were they trying to get the food items donated, they are also looking for more volunteers to help out, so, more people can get in touch with the homeless population. Chu said, a lot of people wouldn’t DARE stare straight into the eyes of the homeless or handicapped people on the streets, feared that it wouldn’t be polite, “turning their heads away, they were actually, refusing to deal with the issues”. They’d hoped, that through sharing of the food, there would be more chances for people to have interactions with the people on the streets who were being ignored by the world, the next step they wished to take is toward the vendors on the streets, to get the public involved, to break the barriers, so people can understand, that even the smallest offerings can help take care of someone in need. So, this, is how kindness starts small, and grows bigger and bigger, isn’t it? The man first felt empathic over the situations he’d encountered, which initiated a response in him, to care, and, through helping, he got to know, that he was making a difference in the lives of those who are homeless, which then became the drive, for him, to keep doing what he was doing, and, he wanted to help others to get to understand the culture of the homeless, so they can be more aware like he himself had become too. Xin-Yun had always had her small Toyota sedan washed at the malls, and, she’d just spent the last of her twenty ticket packages. In the morning, at ten when she drove to the marketplaces, she’d passed through a certain hand-wash car wash, she though, that she could just drop her car off, walked to the marketplace, and afterwards, she could get her car back. The man glanced over at her license plate, said, “I’ll take down your license plate, at four in the afternoon, because it’s the New Year’s, the price will increase to $450N.T.s”. Xin-Yun thought, four more days until New Year’s Eve, it’s normal for the car washes to hike up the prices, I’ll do something else now, and, drop my car off at four, and go shopping at the dusk market place. She’d recalled how unrelenting the man who looked mean was, actually, he looked, like an awful person. She thought about the shocking events from four days ago, the shooting at the jail that alerted every member of the public, of how the six escapees all committed suicide. She thought, that maybe, the owner of this carwash is a reformed inmate who’d started his life anew. Hsin-Yun told him, “Then I’ll sit down to wait.”, she’d found a chair by the desk and sat. The harsher the jokes, it means that more tightly-knit the family members. As Hsin-Yun left the carwash with her car, she’d lifted her head up to see the signs, “The Honesty Carwash”. And so, this man kept his family well, and because he was able to manage his own family so very well, naturally, his business is well off too, because everything starts at the MOST basic levels, and, the most basic functional unit of the societies would be the families, and, this man treated his family well, and, the children are very well-rounded, so naturally, his business is well-off also. Without the darkness in his past, he couldn’t have produced such inspirational works, I know, it’s odd, how someone with such a dark past, can produce so much brightness in his work, right??? But, perhaps, it’s because of ALL that darkness, that enveloped his past, that he felt compelled, to produce those works of light, who knows. One thing’s for sure though, his work had, inspired a lot of people, helped a lot of lost souls find the light. Without the darkness of his past, he couldn’t have produced such inspirational work, he’d managed, to turn his own life around, and left it all, behind. His “former” life was filled with, a TON of uneasiness, a lot of pain, suffering, discomfort he can’t run from, and so, he’d faced them all, HEAD-ON. And now, he’s out of the dark, and he’s using his own experiences, battling with the addictions, the pains, to help others, hoping, that his life can be something that motivated others. It’s just, hard to imagine, that someone, whose work is filled with so much hope, so much goodness, came from this awful a past, and, after knowing this, his audience applauded him even louder, because we ALL know how hard it is, to overcome, and he did, MORE than that already!